Our Italy SIM cards have been specifically created to fit the needs of Americans and Canadians traveling to Italy who need to have cellular and data service. Verizon, Sprint, AT&T and T-mobile's roaming rates are expensive and/or their data speeds are painfully slow. If you are looking for exceptional cellular coverage and service for your trip to Italy, simply choose your plan and we will send you an Italian SIM card that will give you 30 days of service on your unlocked device. Need more than 30 days? Add additional 28 day service bundles and enjoy exceptional cellular and data service for as long as you need. We offer two different plans. The first is recommended for the average tourist. In fact, it is called the Tourist Plan.The Tourist Plan offers a fair amount of local and international calling plus 10GB of 4G/LTE data. The second plan is for travelers, often professionals (like travel writers and videographers) or students. who need an exceptional amount of data (50GB of 4G/LTE) as well as unlimited calling within Italy. While calls in Italy are unlimited, this plan, called the Professional Plan, does not have international calling but you can of course call internationally with Skype, WhatsApp or any other app that uses data. If you are a tourist planning to drive around Italy and use Google Maps, we recommend that you choose this plan. Please note that in order to text, for either plan, you will need to use an app such as WhatsApp or iMessage. The carrier is Vodafone (the largest carrier in Italy and the second largest in the world) and provides excellent coverage and data speeds throughout Italy, including Sicily, Sardinia and virtually anywhere else in Italy. Italian law requires you to provide us a scanned picture of the photo page of your passport or valid driver's license for registration. Vodafone 4G coverage is throughout Italy. Will the Italy SIM card work with my phone? As long as your cell phone is unlocked and has the 900 and 1800 Mhz bands, it is compatible with your phone with voice and as long as it has the 2100 3G networks, it is compatible with data. Most smartphones are compatible with Italian SIM cards in terms of the bands. Verizon smartphones are always unlocked, phones purchased directly from Apple are always unlocked but most phones from other carriers are locked. You cannot tell physically if your cell phone is unlocked. If you are with AT&T and you put a different SIM card (such as T-Mobile) in and it picks up a network, it is unlocked. Conversely, if you put another SIM card in and it says, "enter subsidy code" or similar, it is locked. Call your carrier to check to see if your phone is unlocked or if it qualifies for being unlocked. Please note that all Verizon iPhone 5, 6, 7, 8 and X are unlocked and all phones purchased directly through Apple are unlocked. The Italian SIM card is a 3-1 SIM card meaning, you can just snap it out to fit your phone. How do I know if I need a micro SIM card, a nano SIM card or a standard Italian SIM card? It is not easy to discern the size of the SIM card by looking at it as the sizes vary literally only by fractions of an inch. The best way to check to see what SIM card you need is to Google "SIM card size". Regardless, our SIM card will fit any phone or device. We will send you instructions together with the SIM card but essentially you will need to send us via email a copy of a driver's license or a passport plus the day you would like the service activated. Why don't I just purchase a SIM card when I get to Italy? Purchasing a SIM card for your phone when you arrive in Italy is inconvenient. Most people do not want to cut into their vacation time in order to do so. Plus, they want to have the phone number before they leave and their phone available to use as soon as they arrive. In addition, the Uno Mobile SIM card has better rates and bundles than SIM cards available in Italy as well as features such as a US number add on, and, has English instructions and English speaking customer service. Can I buy the Uno Mobile SIM card in Italy? 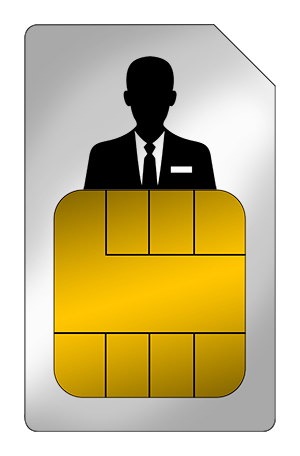 The particular version of the SIM card we sell has been specifically tailored for English speaking travelers and is not available in Italy. Cellular Abroad is the exclusive reseller in the United States and Canada and has been since 2008. In a word; excellent. The SIM card uses Vodafone which is the second largest carrier in the world. As a rule of thumb, as long as there are roads that are traveled on and houses where people live, there is coverage, including the islands of Sicily and Sardinia. Will it work as soon as I land in Italy? Yes but remember to follow instructions regarding activating your SIM and remember to set the APN. The SIM card comes with activation instructions. The APN is a setting in the phone that makes the data work. While easy to do, you may want to Google how to set the APN for your handset in order to view a visual guide or a video. Does it work outside of Italy? Yes but you will have to add credit and you incur roaming rates. Unless you are taking a short trip outside of Italy (ex. Switzerland for the day), we don't recommend roaming with your SIM card. How much will it cost people in the USA/Canada to call me on my Italian number? That depends on their plan. A great option is to add the "US Number" feature to your service. Each $19 will give you 360 minutes of incoming calls on a US number. If you are forwarding a cell phone number, most smartphones have a call forwarding setting. Make sure you forward the calls to the US number so you don't pay international dialing calls! Why don't I just use free Wi Fi? Some people rarely need to use the internet. If you only need to check your emails once a day or less, then this might be a good alternative to you. Remember that free Wi Fi is not always fast, nor is it reliable, nor is it secure. Can I use the SIM card next year when I go to Italy? Yes. As long as you add call credit at least once every year, you can retain your number and service.